461 pages | 40 Color Illus. | 189 B/W Illus. Computational and Visualization Techniques for Structural Bioinformatics Using Chimera shows how to perform computations with Python scripts in the Chimera environment. It focuses on the three core areas needed to study structural bioinformatics: biochemistry, mathematics, and computation. The book covers topics that deal primarily with protein structure and includes many exercises that are grounded in biological problems at the molecular level. The text encourages mathematical analysis by providing a firm foundation for computations. It analyzes numerous Python scripts for the Chimera environment, with the scripts and other material available on a supplementary website. Through more than 60 exercises that involve the development of Python scripts, the book gives you concrete guidance on using the scripting capabilities of Chimera. You’ll gain experience in solving real problems as well as understand the various applications of linear algebra. You can also use the scripts as starting points for the development of similar applications and use classes from the StructBio toolkit for computations, such as structure overlap, data plotting, scenographics, and display of residue networks. "This book supports an approach to bioinformatics that balances biological problems, mathematical modeling, and computational tools. It breaks down the mathematical complications into manageable parts and augments programming skills while developing biological insight." "This book is a useful resource for experienced and newcomer Chimera users alike. It helps extend it programmatically, allowing users to perform any number of useful types of calculations that are often required in conjunction with visualization. 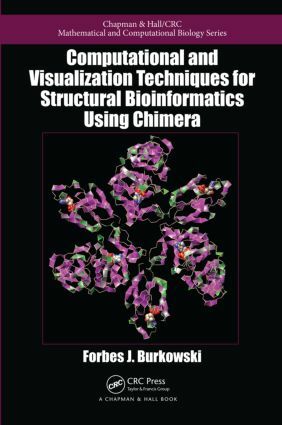 From distances to graphs, any way you measure it, Prof. Burkowski’s book is a must have for Chimera users." "Structural bioinformatics is a young science that lies at the crossroads of several synergizing disciplines, including biophysics, structural biology, mathematical modeling, and computational methods. In this context, the book by Forbes Burkowski constitutes a true landmark, enabling the practitioner to implement and exploit computational techniques to test the mathematical models and frame novel hypothesis. This engrossing book is directed at advanced undergraduates and professionals who seek to represent and explore novel structural concepts to describe biomolecular phenomena. Very useful practical applications of the computational techniques presented in the book are likely to emerge, especially in the fields of molecular engineering and structure-based drug design. Thus, I predict that the book will become mandatory for researchers interested in rational design in the pharmaceutical industry and materials science." "Students taught with Computational and Visualization Techniques for Structural Bioinformatics Using Chimera will gain not only a thorough understanding of the important concepts of structural bioinformatics, from the basics of protein structure through advanced topics such as molecular mechanics, but also the ability to perform their own analyses using the programming techniques and libraries offered by this book and its supporting materials. The exercises are engaging and vary from problems that can be solved in a few minutes to mini-projects that might require a week of effort. All concepts are clearly described and accompanied by helpful illustrations where needed. This text does an excellent job of turning students into investigators." Forbes Burkowski is a professor of computer science at the University of Waterloo in Ontario, Canada.